Could there be a holiday more representative of the true nature of American culture than Thanksgiving? Considered the least commercial of our national holidays, yet the true theme of the day is consumption. Family, food, and football are all available in quantities large enough to cause a bit of indigestion. Moreover, the entire event is just a warm up, an appetizer that signals the start of a dietary and retail feeding frenzy. 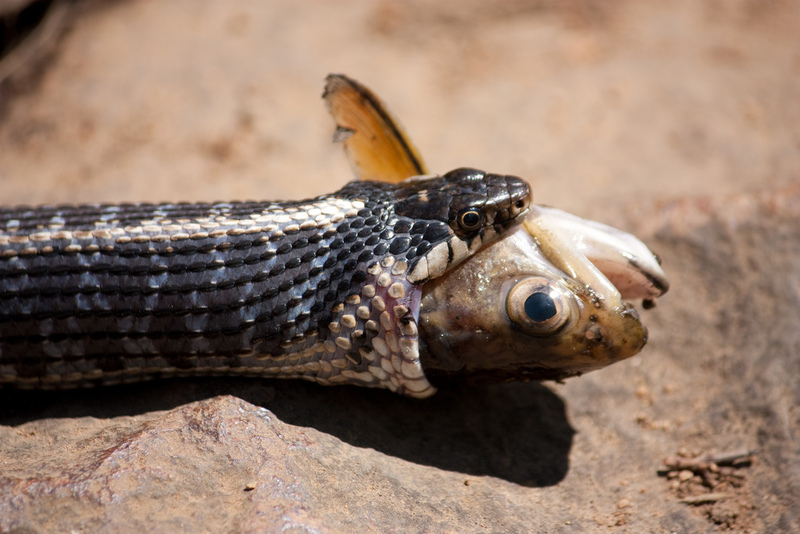 A turkey is the holiday’s traditional mascot, not to mention the main course, but I’d like to suggest a different and even more appropriate talisman for a day devoted to stuffing one’s face—the garter snake (Thamnophis spp.). Thought to resemble the fanciful bands that held up men’s and ladies’ hosiery in a pre-elastic era, garter snakes are as American as pumpkin pies and pigskins. The most widely distributed reptile genus in North America, you’ll find them slithering from sea to shining sea across 49 states, including Alaska—the only snake able to make that claim. Remarkable in their ability to adjust to a wide range of habitats, garter snakes live on purple mountain ranges, in amber waves of grain, across the fruited plains, and everywhere in-between. The genus includes 26 species and dozens of subspecies. Most include the “garter” tag as part of their common name, but the western ribbon snake (Thamnophis proximus) and its subspecies are part of the tribe too. Morphologically diverse—even within a species—the unifying theme is one or more stripes that run the length of the body (with or without spots). Some, like the common garter snake (Thamnophis sirtalis), favor an understated tan or brown background with yellow stripes. Other color combos may include: red-orange, black, and creamy yellow (coast garter snake, Thamnophis elegans terrestris); black with a pale teal green stripe and red spots (red-spotted garter snake, Thamnophis sirtalis concinnus); and even a striking electric blue paired with black (Puget Sound garter snake, Thamnophis sirtalis pickeringii). Garter snakes are not picky eaters, and this characteristic has also helped them to spread out across the continent. These legless wonders will eat just about member of the Animal Kingdom they can catch and devour, including slugs, earthworms, fish, frogs and toads, lizards and other snakes, birds (including their eggs and nestlings), and small mammals, including rodents. You’ve heard the phrase “His eyes were bigger than his stomach”? Well, that’s never really a problem for an animal whose stomach, along with the skin, muscles, ribs, throat, and mouth, can expand to accommodate up to 20% of its body weight in a single swallow. Imagine the kind of advantage you’d have in an eating contest if you could loosen your jaw, open wide (150° compared to 45° for the average human), and send a whole turkey down the hatch! Chewing? Why bother? Snakes don’t. They don’t have the choppers for it, although some have a few small teeth that curve toward the back of the mouth and help the reptile “walk” the upper and lower jaws over and around their meal. Concerned about how to breath while a roasted 30 pound tom or hen is passing through your gullet? No worries… if you’re a snake your windpipe is located near the front of your mouth and can move out of the way. If you’re not a snake (and I mean that literally—your in-laws’ opinion doesn’t count)… you may want to reconsider using a knife and fork. Still, when your favorite team is lining up for the opening kickoff on the 55” LCD HDTV with Surround Sound, and Grandma is standing between you and the game with a third helping plate and a look that says responding to her offering with “no thanks, I couldn’t eat another bite” may not kill her, but it will significantly shorten her life—you have to admit, the ability to swallow food whole would sure come in handy. © 2011 Next-Door Nature— no reprints without written permission from the author. Thanks to the following photographers for making their photos available for use through a Creative Commons license: Frank Miles/USFWS (2 common garter snakes); randomtruth (coast garter snake); Jonathan Crowe (red-spotted garter snake); and Dan Dzurisin (Purget Sound garter snake). This entry was posted in garter snakes, reptiles, snakes and tagged backyard wildlife, behavior, Biology, garter snakes, hidden nature, hidden wilderness, hidden wildlife, human-wildlife conflict, natural history, Nature, postaweek2011, reptiles, snakes, suburban wildlife, urban wildlife, watchable wildlife, wildlife by Kieran Lindsey. Bookmark the permalink. Barb, I’ve been studying wildlife for practically my whole life, and I’ve yet to find a species that isn’t amazing in some way. What an incredible world we live in, where we will never run out of interesting characters to meet and enjoy. The other day I found a dead garter snake in the street outside my house. I left it there hoping something else might eat it.